Nowadays, “there’s an app for that” for nearly any question or need you might possibly have –not to mention needs you didn’t even know you had. What you might not realize is that apps –in the sense of a handheld device for manipulating data- are hundreds of years old. Meet the ancestor of your smartphone apps: the volvelle, sometimes called a wheel chart. It’s a (brilliantly) simple paper construction of moving parts; layers of rotating discs with information on them. Externalized, artificial data memory before the printing press, steam power, photography, electricity, ether anesthesia, radar, cars, the internet and wifi. Wow. Gadgets for working with data are even older than paper volvelles. Think of the astrolabe, which had dials that measured the angle of the sun, allowing you to determine accurate time. Useful as an astrolabe was, it was very fine metalwork and, therefore, expensive. Paper devices were a more economical idea. Two views of an astronomical volvelle from Federici Chrisogno’s De modo collegiandi pronosticandi et curandi febres (1528). Chrisogno was among the first to posit that the cause of tides was connected to the moon and the sun. Note among the exquisite details the tiny human faces on the sun and moon orbs (in the edges of the top two discs) and the delicate astrological symbols (around the outer disc’s rim). Like many scientific innovations, volvelles came to Europe from the Arabic world during the 11th and 12th centuries in medicinal and astronomical works. One of the earliest extant volvelles was created by Ramon Llull from Majorca (modern day Spain) in his Ars Magna published in 1305. His volvelle, “The Night Sphere,” could be used to calculate the time at night by aligning the device with the pole star –exact times being important to him for knowing the most auspicious times to administer medicine. Incidentally, the European adoption of this useful device is reflected in the name we have for it, volvelle, from the Latin volvere meaning “to turn.” The scope of information that volvelles depict is huge. Besides astronomy, subjects include: verb conjugations, color wheels, metric conversions, fortune-telling, first-aid techniques, and local seasonal foods (such as in the modern example below). 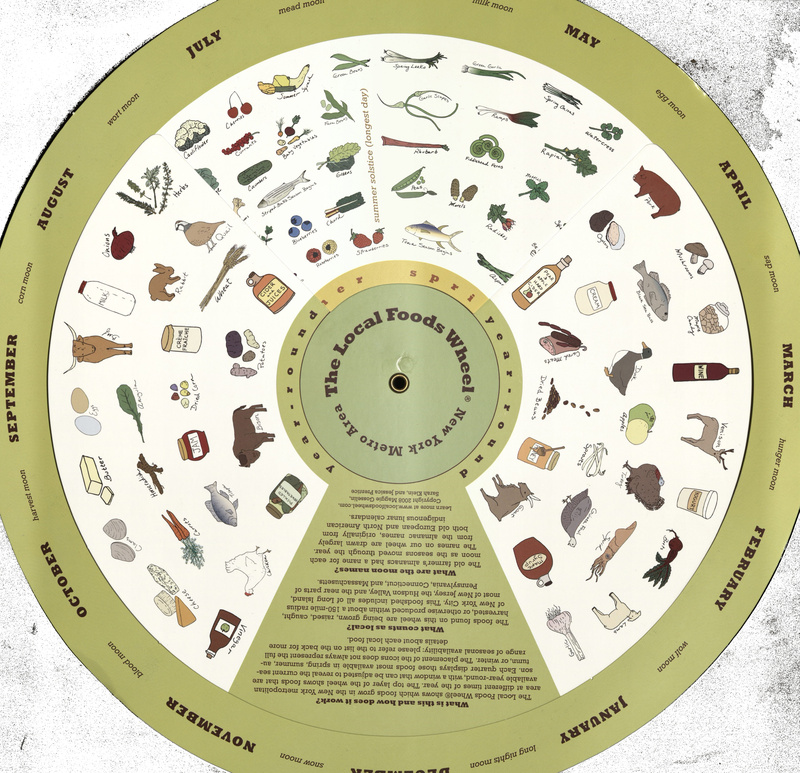 The Local Foods Wheel, New York Metro Area; 2015. Some volvelle constructions can get very elaborate in form, like this unusual and entertaining piece in our collection, The Bodyscope (1948), by Ralph H. Segal and Theodore I. Segal, with illustrations by William Brown McNett. 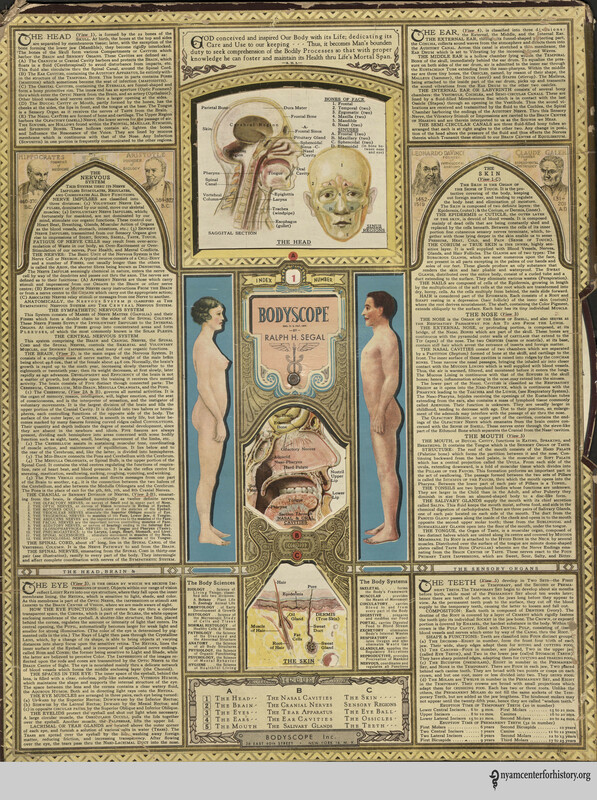 It is a color-lithographed, interactive anatomical chart designed for the educated lay public. When opened, the chart displays a male figure on the left and a female figure on the right, surrounded by skeletons and muscle men. Each of the large figures houses a volvelle that, when rotated, displays five different views of the internal organs. Additional cut-outs on the front and back of the chart also change as the volvelles move to display additional views of various body parts and systems. The Bodyscope (1948) by Ralph H. Segal and Theodore I. Segal, with illustrations by William Brown McNett. Inspired by volvelles in our collections, we’ve gotten creative for the upcoming Museum Mile Festival, Tuesday June 13 from 6-9pm along Fifth Avenue. It’s a delightful cultural block party; seven museums are open for free, and there are special crafts and performances. An evening you won’t want to miss! Especially since we’ve created a DIY volvelle for festival goers to make for themselves. Our volvelle feature male and female bodies created by the highly influential Dutch physician and anatomist, Andreas Vesalius, for De Humani Corpis Fabrica (1543). The Fabrica was groundbreaking not only for its artistry, but for its promotion of learning about human anatomy through dissection. Understanding of the human body had been dominated in the West since the third century by the work of the Greek anatomist Galen, who performed animal dissection. Vesalius’ work on cadavers revealed anatomical errors in Galen’s work and pushed medical knowledge forward. Our DIY volvelles let you deepen your own anatomical knowledge by adding in human organs (from the well-known Gray’s Anatomy) and anatomy facts of your choice. See you at the Festival! Special thanks to Anne Garner for information on The Bodyscope, and the Library extends our gratitude to Harlem Artist & Craftsman for the generous donation of supplies for the Festival. Adam Rothstein. The Original Mobile App was Made of Paper. Retrieved from https://motherboard.vice.com/en_us/article/the-earliest-mobile-apps. Federico Bonelli, Lucio Russo. 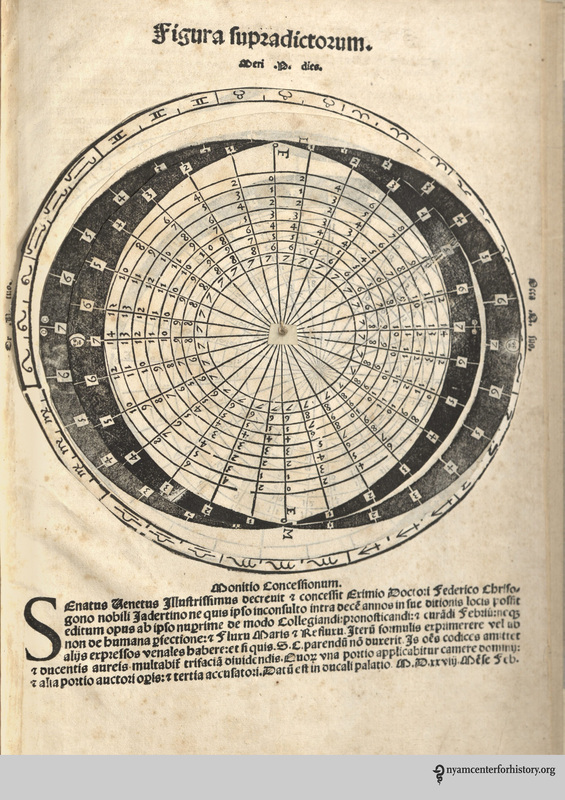 The Origin of Modern Astronomical Theories of Tides: Chrisogno, de Dominis and Their Sources. The British Journal for the History of Science. 1996; 29 (4): 385-401. David Kahn. On the Origin of Polyalphabetic Substitution. Isis. 1980, 71 (1): 122-127. Rheagan Martin. Decoding the Medieval volvelle. 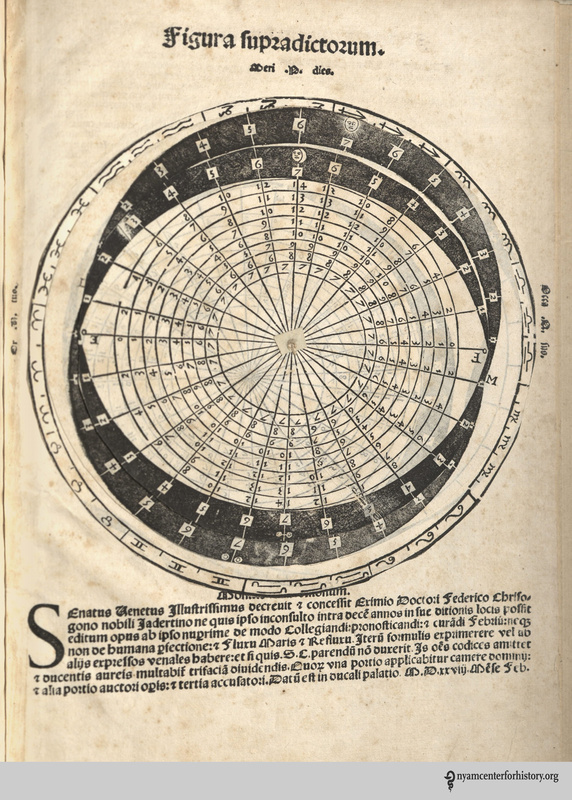 Retrieved from http://blogs.getty.edu/iris/decoding-the-medieval-volvelle/. Accessed March 14, 2017. This entry was posted in Collections, Events, History of medicine and tagged anatomy, Museum Mile, volvelle by nyamhistmed. Bookmark the permalink.